WASHINGTON (CNN) -- Investigators had a "significant break" in tracking the salmonella outbreak when they found the bacteria on a jalapeño pepper imported from Mexico at a Texas food supplier, the Food and Drug Administration announced Monday. 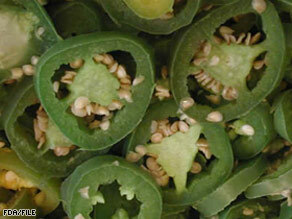 The FDA has discouraged all consumers from eating raw jalapeño peppers. The FDA also warned consumers not to eat fresh jalapeños and products made with fresh jalapeños. The discovery may provide a clue to the source of a recent outbreak of Salmonella Saintpaul. The bacteria have sickened more than 1,200 people in 42 states, according to the Centers for Disease Control and Prevention. Tauxe called the discovery a "significant break." "While this one sample does not give us the whole story, this genetic break is very important," he said. "This will hopefully help us pinpoint the source of this outbreak." Would you know if you had salmonella? "This does not mean that the pepper was contaminated in Mexico," he said. "We aren't only looking for the source, but the reason for the spread [of the outbreak]." Before Monday's warning, the agency had discouraged high-risk people -- elderly people, infants and those with impaired immune systems -- from eating serrano and jalapeño peppers. Two elderly men with pre-existing conditions died while infected with Salmonella Saintpaul, and the FDA said the infection could have contributed to their deaths.